UMass Amherst is the largest campus in the University of Massachusetts system with a campus community exceeding 30,000. The Minutemen’s and Minutewomen’s Basketball teams are members of Division I of the National Collegiate Athletic Association (NCAA) and members of the Atlantic Ten Conference. For many years, basketball team games have been held in the Mullins Center, a multi-purpose arena that hosts not only basketball but also men’s hockey, university events including commencement, and numerous concerts and public events. The basketball programs did not have designated training and conditioning space, and could only practice at the Mullins Center on the rare occasions when it was not in use or at the outdated Curry Hicks Physical Education Building, a facility lacking necessary amenities not in compliance with Title 9. 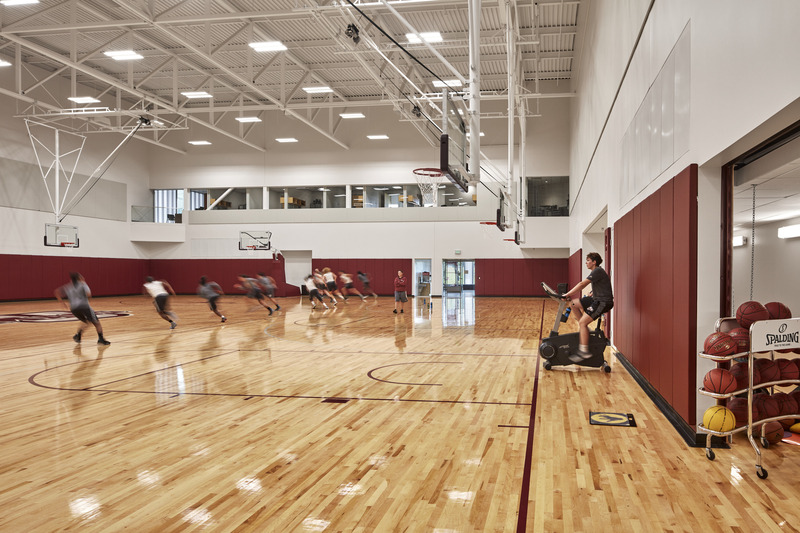 The new Champions Center at UMass Amherst provides identical practice courts, team rooms, and administrative centers for men’s and women’s varsity basketball. 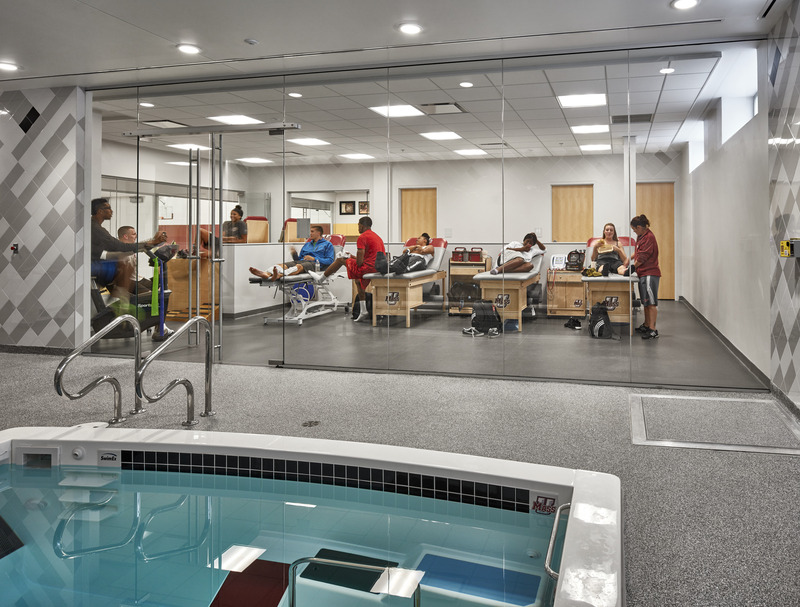 The programs share a 2,800 square foot weight training center, a 1,700 square foot nutrition center, a 1,900 square foot sports med center with a hydrotherapy spa, a 1,200 square foot “legacy hall”, and a film room that seats 24. Located south of the Mullins Center arena, the building makes a direct connection to the event floor to enable the team rooms to be used during games. Built at the level of the fields, and into the grade eighteen feet below Commonwealth Avenue, the new building is the initial development in the extension of the campus framework to the west. The building is designed to provide entrances that are accessible from the main campus on the east and from the parking supply on the west. A new grand staircase and elevator are incorporated as building features that improve access to the playing fields. 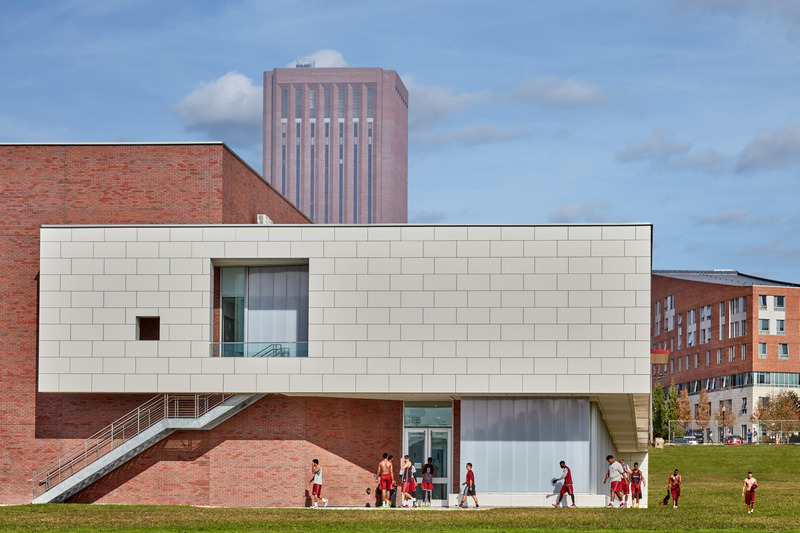 Drawing from the surrounding context, the building’s exterior is clad in Portuguese limestone, brick, curtain wall and polycarbonate panels. The transparent facade along Commonwealth Avenue provides visual access to the highly branded “Legacy Hall” (of fame) . 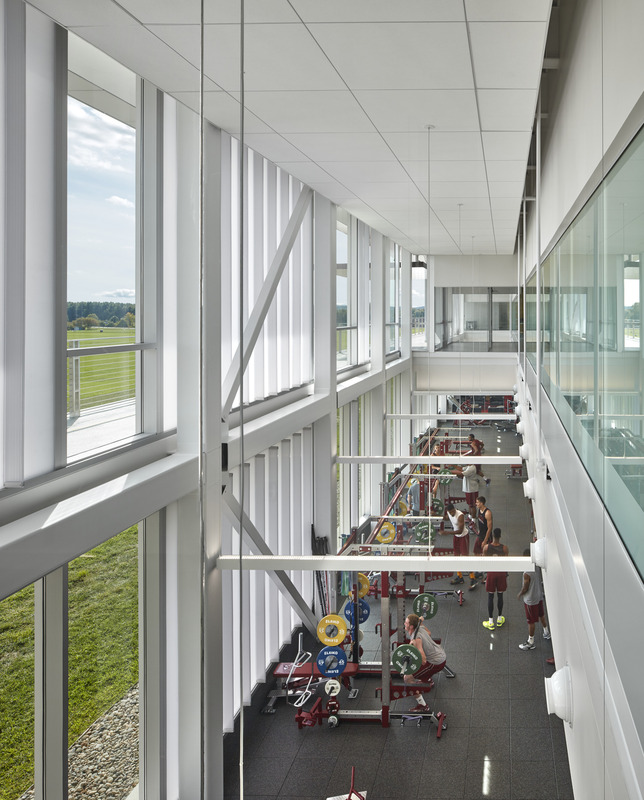 On the south facade, extensive daylighting of the weight room and nutrition area is accomplished by combining the use of curtain wall and polycarbonate panel . The project is designed to achieve LEED Gold certification. Just as with Division 1 campuses across the country, the development of student-athletes at UMass Amherst is complex. This basketball development center would have to support strength and conditioning, good nutrition, rest and recovery, individual and team practice time, training and treatment, film study, and academic success. Efficiency is critical; daily life of the student-athletes can be demanding. JCJ leveraged every opportunity to optimize adjacencies, maximize the budget to create an agile, high performance, state-of-the-art facility, and provide enduring design. Athletics programs must meet the changing demands of collegiate athletics in order to recruit the best candidates and create cohesive and successful programs. 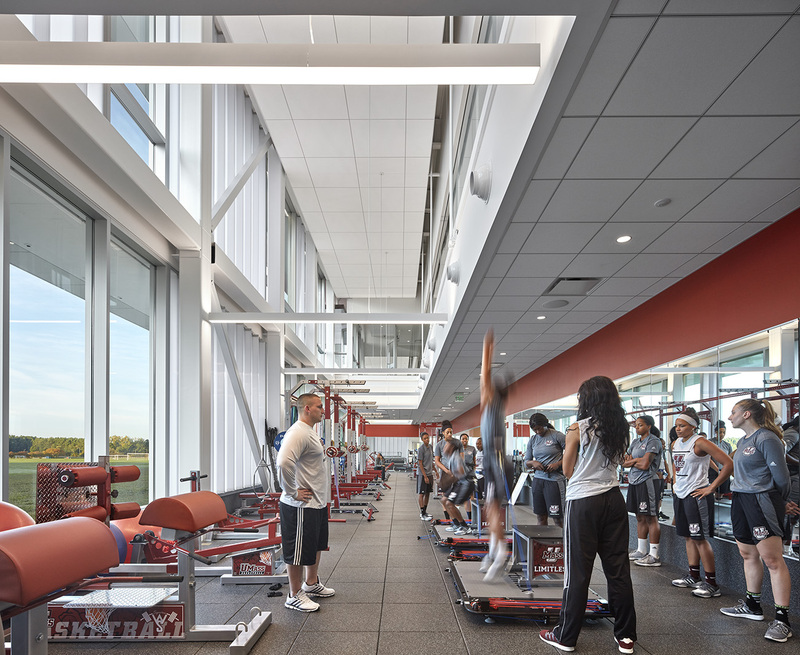 From the first time a prospective student-athlete visits UMass Amherst to the day they earn their degree, superior facility, coaching, and education are critical to their holistic development. 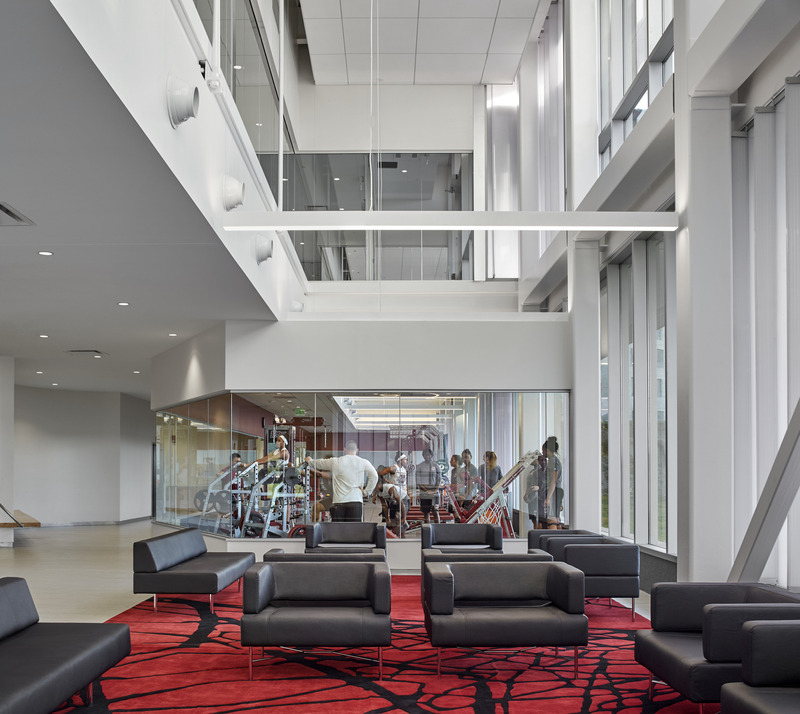 Additionally, design that fosters a lifetime connection between the student-athletes and a program- encouraging return to campus and giving back to the next generation of student-athletes as well as though who use the facility through intramural sports involvement was a goal. The University also desired a direct physical connection between the new facility and the Mullins Center and to allow for development of additional space to house future phases of the program. The Champions Center project has received numerous accolades from members of the athletics staff, from students and from peer institutions. The project has provided parity between the men’s and women’s programs and has been a significant tool in the recruitment of talent to the University’s Division 1 program.